Prayers Before Town Hall Meetings Are Constitutional, High Court Finds : The Two-Way In a 5-4 decision, the court said the Greece, N.Y., council was using prayer for "permissible ceremonial purposes," not as an "unconstitutional establishment of religion." Members of the media camp outside the U.S. Supreme Court in June of 2013. A city council in upstate New York is not violating the Constitution when it opens its meetings with a prayer, the U.S. Supreme Court held Monday with a 5-4 vote. As we've reported, the town of Greece, N.Y., used to open its board meetings with a moment of silence. But in 1999, when a new supervisor took over, he "instituted formal prayers, given by a rotating group of clergymen — a group that until 2008 was exclusively Christian. Often prayers were 'in the name of the Lord and Savior Jesus Christ who lives with you,' for instance." Two women — one atheist, one Jewish — sued the city, saying it was an unconstitutional establishment of religion. Today, the high court held that the council was using prayer for "permissible ceremonial purposes," not as an "unconstitutional establishment of religion." University of Notre Dame Professor of Law and religious freedom expert Richard W. Garnett says that today's decision doesn't change the way this kind of prayer has been viewed historically. "It would have been a dramatic and controversial move — a move that the [Obama] Administration, among others, argued against — to rule that legislative prayers are necessarily unconstitutional," Garnett tells us in an email. 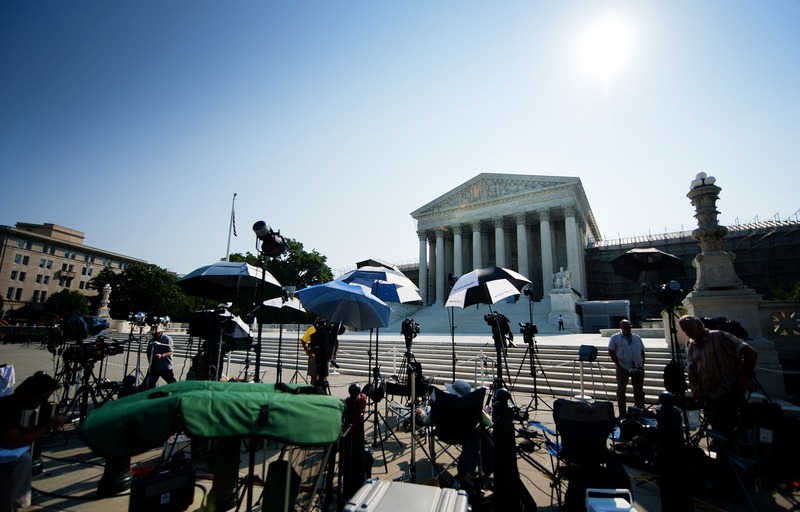 "And, none of the Justices endorsed such a departure from past practices and rulings. As a result, though, the law in this area remains as muddled and difficult to apply has it has been for the past 30 years. Legislative prayers, even ones that are 'sectarian,' are permissible, sometimes, depending on context and circumstances." In the majority opinion, Justice Anthony Kennedy argued that ceremonial prayer is a tradition that dates back to this nation's founding. Indeed, that was a position that the Obama administration took in the amicus brief it filed last summer. Praying before a meeting goes back to "the first session of the Continental Congress in 1774," the administration argued. What's more, one of the first things the U.S. House and Senate are tasked with is the selection of a chaplain. As long as there is no endorsement of religion, the practice is constitutional. "Ceremonial prayer is but a recognition that, since this Nation was founded and until the present day, many Americans deem that their own existence must be under­ stood by precepts far beyond the authority of government to alter or define and that willing participation in civic affairs can be consistent with a brief acknowledgment of their belief in a higher power, always with due respect for those who adhere to other beliefs. The prayer in this case has a permissible ceremonial purpose. It is not an uncon­stitutional establishment of religion." In his dissent, Justice Stephen Breyer focuses on one of the facts in the case: With few exceptions, the town of Greece called on Christians to deliver the prayer. "The question in this case is whether the prayer practice of the town of Greece, by doing too little to reflect the religious diversity of its citizens, did too much, even if unintentionally, to promote the 'political division along religious lines' that 'was one of the principal evils against which the First Amendment was intended to protect.' Lemon v. Kurtzman, 403 U. S. 602, 622 (1971)." Like Justice Elena Kagan, Breyer concludes "the town of Greece failed to make reasonable efforts to include prayer givers of minority faiths, with the result that, although it is a community of several faiths, its prayer givers were almost exclusively persons of a single faith." Because of that, Breyer writes, the town violated the Establishment Clause of the constitution.